Home-Mart, Inc. opened in October of 1988 and is the premier customer traffic sales center for manufactured housing in the four state area that includes Oklahoma, Kansas, Missouri and Arkansas. Outstanding in luxurious entertainment! Sit down and enjoy the built in surround sound system with the DVD player and big screen TV. 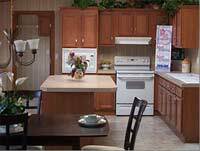 Enjoy the open and spacious kitchen and dining room. Optional hall computer office. Delivery and set up including within 100 miles. At Home-Mart. Spacious home for all your needs. Huge living room. Open island kitchen with huge dining area. Three full bathrooms with added options. Five large bedrooms. Den and stairwell options at Home-Mart. Large, open living room. Connected kitchen and dining room, with massive amounts of drawer and cupboard space, for easy access. Make sure to check out the hidden pantry for storage. See the options at Home-Mart. HUGE great room and connecting dining room with large picture windows. Open kitchen and breakfast nook. From the outside it looks like a mountain cabin, but inside is a completely different story. With the elegance of a cathedral ceiling and a spacious great room it is more like a New York apartment. It is perfect for by the lake or in a neighborhood. Come see it at Home-Mart. Entertainment series with big screen and 600 watt home theater DVD surround sound system. A gem in our entertainment series. Two huge living areas, one with the built in surround sound system with the DVD player and big screen TV. The Gigantic island-kitchen and dining room is the added bonus to see at Home-Mart. With the large central living room with area for everyone to gather. A spacious kitchen and dining area with plenty of storage space in cupboards and drawers, and a bar-style counter. Even the extra bedrooms. This is a perfect home to come see at Home-Mart. A favorite floor plan is returning! From the beautiful hutch to the HUGE walk-in pantry / storage area in the kitchen. Add to that the large master bedroom with its walk-in closet. It could be just what you are looking for, here at Home-Mart. Shop with Ease at Home-Mart"